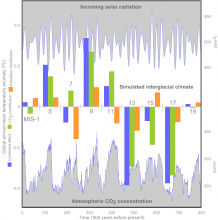 Study of past, current and future climates using a system dynamics approach and a combination of observations and models of different complexities. 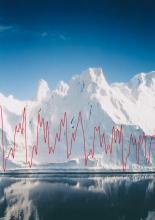 We address mathematical and statistical aspects of climate and palaeoclimate dynamics, with references to dynamical system theory, experiments with general circulation models, Bayesian inference and time-series analysis methods to characterise the dynamics of the climate system, estimate its predictability and identify physical mechanisms of variability. A variety of models, including the Louvain-la-Neuve sea ice model, are developed and used in combination with observations to improve our understanding of sea ice processes and variability as well as our ability to perform predictions of sea ice and its interactions with the rest of the climate system on sub-seasonal-to-decadal timescales. Observations and model results are combined through data assimilation to reconstruct past changes over the last century to millennia, to understand the mechanisms responsible for those changes and predict future variations. A particular focus is put on Antarctica and Southern Ocean dynamics. Both geological observations and climate models of different complexities are used to reconstruct and understand global and regional climate changes of the past million years with a focus on interglacial climate having in mind a better understanding of our future global warming. Special focuses are also on paleo-monsoon dynamics and on interactions between soil and climate. Study of land use dynamics in the globalization era, with a focus on tropical forests and agricultural changes, on land use displacement across countries, and health impacts of land use. We analyze causes and impacts of land use transitions including forest transitions - national-scale shifts from net deforestation to net reforestation, - and emerging agricultural frontiers, combining remote sensing, GIS, census and trade data. We study the design and effectiveness of public and private policies to promote sustainable land use, including zero deforestation commitments by global coalitions of private companies, governments and non-governmental organizations. We study how land use and other environmental determinants affect health, with a focus on vector-borne and zoonotic diseases in tropical and temperate areas, using concepts and techniques from spatial epidemiology and ecology. Study of soil, sediment and nutrient fluxes over timescales ranging from the decade to the millennium, with focus on the sensitivity of soilscapes to climate and human disturbances. The research involves experimental studies, field and laboratory measurements and numerical modeling. We monitor changes in soil carbon content to quantify soil-atmosphere CO2 fluxes and changes in soil quality. Vertical and lateral fluxes of sediment and carbon. We use in-situ produced (Al-26, Be-10) and meteoric (Be-10) cosmogenic radionuclides to constrain dates and rates of geomorphic processes including physical erosion and denudation rates of mountain regions, and chemical weathering rates of the critical zone. We develop UAV-based techniques to monitor 4D changes in soil and terrain attributes using UAV-SfM (structure from motion) techniques. Hyperspectral remote sensing techniques are being developed for up-to-date soil carbon estimates using the future generation of satellites. Apart from the Sun, the largest bodies of the Solar System are the eight major planets, sometimes surrounded by large moons. Properties of these bodies (including the Earth) can be studied from spacecraft sent by the Space Agencies such as ESA (European Space Agency). In particular, radioscience and radiation environment are central concerns at UCL. The habitability of a planet is related to its evolution, which very much depends on its position with respect to the Sun and the evolution of its interior and atmosphere for the existence of liquid water at the surface. The deep interior of a planet or a moon can be measured by its rotation. An everyday example of the influence of the physical state of the interior on the rotation is that raw (liquid) and cooked (solid) eggs rotate differently. We study the rotation of celestial bodies of the Solar System in order to characterize their interior, their evolution, and their habitability. The CSR conducts research aimed at providing the Space Physics community (researchers, instrument developers, aerospace industry) with the most accurate characteristics of the space radiation environment. It is mainly active in the following fields: Operations of PROBA-V/EPT and Data exploitation; design/prototyping of space radiation spectrometers; theoretical studies and modelling of radiation environments; and study of radiation effects on material/components.